The wonderful thing about 3-hole faucets is that they can be just about anything you want them to be! With 3 holes to work with, you can have a single-handle faucet with an escutcheon, a dual-handle faucet with a central spigot, or even an assembly with a soap dispenser. In this guide, we’ll show you the best 3-hole kitchen faucets on the market. We’ll tell you all about why we love these specific fixtures, and give you some practical advice for choosing your ideal one. Read on to see which 3-hole kitchen faucets we currently recommend, and to find out why these specific models made our cut! This Pfister fixture is our budget recommendation in the 3-hole category. It’s simple, sturdy, and elegant–everything you want in a kitchen faucet! It looks great. The stainless finish is the real deal: vibrant, clean, and easy to keep looking good over time. It’s not plastic. That’s extremely rare at this price and beyond. If you (like us) hate cheap-feeling fixtures, the Pfister is a welcome standout. The guts are rugged as well: the Pfister uses a ceramic valve at a price where most other fixtures use plastic that fails quickly. It’s covered by a lifetime warranty and has a stellar reputation for long-term performance. Two-handle designs like this are a matter of individual preference. Some people prefer the traditional controls, but more modern single-handle designs are a more efficient use of space. This Delta fixture is our recommendation to anyone who wants to keep things as simple as possible. It’s essentially the same as the Pfister, only with one control knob rather than two. It’s brass, despite the chrome finish. It’s one of very few chrome-finish fixtures that’s not cheap, coated plastic. This one’s as well-made as faucets costing several times as much. It looks great. This one’s perfect for those who want to keep things as simple and elegant as they can. While it uses an escutcheon to cover all three holes, it doesn’t look like it’s wider than it should be. The baseplate slopes nicely to make the faucet seem to rise naturally from the sink surface. As with the Pfister, it’s pretty limited in terms of features and functionality. This is for people who want to make a 3-hole sink as simple as possible, not for those who want to make the most of their real estate. The Delta Kate is our recommendation to most buyers. We think it’s the best balance of build quality, functionality, and value in the 3-hole category. It includes a pull-down, integrated sprayer, plus a soap dispenser and side-mounted control knob. It makes the most of your sink real estate. Thanks to the pull-down sprayer head, we think it’s the most space-efficient 3-hole fixture on the market right now. Plus, it’s very ergonomic and well laid-out. It’s miles better-made than comparable fixtures for the same price. There’s very little plastic, and the key components (like the seals, sprayer lock, and counterweight) are stellar. It’s covered by a lifetime warranty, just like our other recommendations. If you don’t want a soap dispenser, or prefer a separate sprayer, the Kohler Forte below is a better choice. Likewise, if you’re going for sheer elegance, the Moen Edison does outclass this. However, the Kate goes with nearly any decor style and best suits the needs of the average user. That’s why we think most folks can save money and stick with this without missing anything. Moen’s Edison is our top recommendation in this category for those who are after a traditional decor style in their kitchen. It has a very Victorian design that fits well with anything from period to farmhouse aesthetics. The finish is fantastic. It resists spots and stains, and doesn’t scratch. The stainless steel looks bright, without being too flashy. It’s the epitome of class. The Edison looks elegant and refined, with plenty of character to suit any traditional decor. There are just enough ornate touches to match any older furnishings you may have, without making it hard to clean. It’s well-made. This one’s mostly metal, aside from the soap dispenser and parts of the sprayer. It’s very functional, for something that looks relatively old-fashioned. It’s not a good choice for contemporary decor or modern kitchen designs. To take full advantage of the Edison’s functionality, you’ll need a fourth hole to install the soap dispenser. There’s a disappointing amount of plastic on this one, despite the fact that it’s relatively solid and has a great long-term track record. 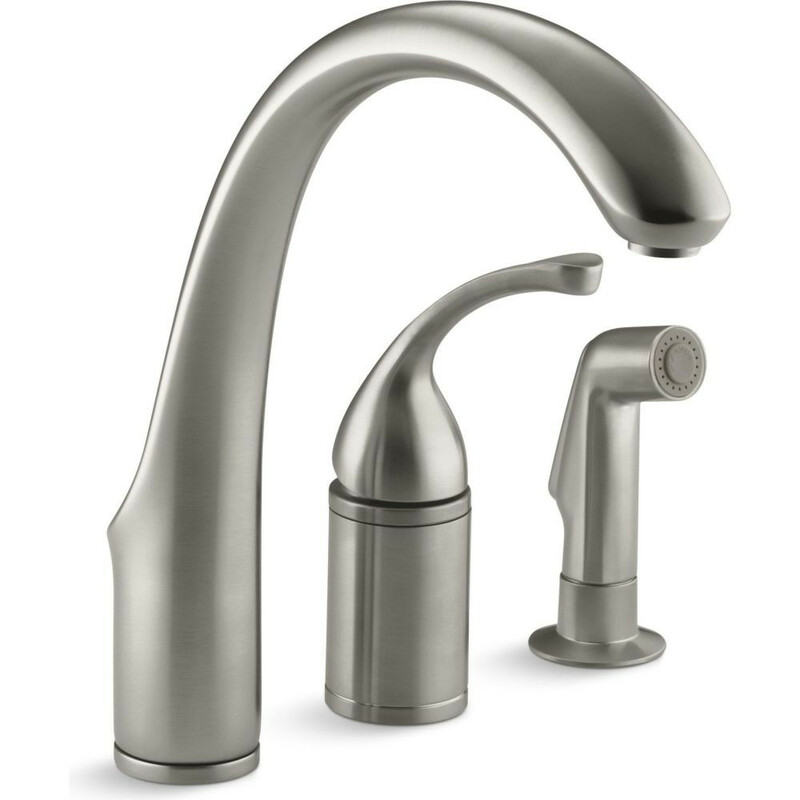 Our ultimate recommendation for a 3-hole kitchen faucet is this Kohler Forte model. It’s the absolute best fixture in this category for build quality, functionality, and overall looks. It’s all metal. This one is as durable and reliable as anything else you can buy for your kitchen. It comes in a wide range of finishes, unlike our other recommendations. That makes it easy to find just the right fit for your sink and for the rest of your kitchen. It’s extremely elegant. The graceful curves and simple lines add class to your space without appearing overstated or plain. It looks good with just about anything–even more traditional aesthetics. It’s also highly functional, with a temperature limiter and a ceramic valve. It’s not going to work as well as the Edison with ornate, traditional decor styles. It’s extremely expensive. Depending on the finish you choose, you could end up spending as much as $350 for the Kohler Forte. This one’s definitely not for anyone on a budget. Which of these kitchen faucets should you buy for your 3-hole sink? The Pfister is our recommendation to anyone who needs to suit a 3-hole sink on a budget. It’s rather simple, and doesn’t include a sprayer, but it’s sturdy and looks good with practically any style of decor. We think it’s by far the best 2-handle model under $200. The Delta Classic is our recommendation to anyone who wants to keep things simple. While it doesn’t pack as many features as a fixture with a sprayer or soap dispenser, it’s built like a tank and adds an elegant simplicity to a 3-hole sink. The Delta Kate is our recommendation to the average buyer. We think it’s the best balance of quality, functionality and value on the market right now. Its pull-down sprayer makes the absolute most of your three holes, since it allows you to add a soap dispenser without taking up any extra room. The Moen Edison and Kohler Forte are a big more premium, but we do feel that they give you less bang for your buck. The Moen Edison is our recommendation to anyone who wants a 3-hole faucet that suits old-school, traditional design elements in the rest of the kitchen. It has a far more ornate look than our other recommendations, but the build quality keeps it from feeling delicate. The Kohler Forte is our ultimate 3-hole kitchen faucet recommendation, so long as you can afford the price tag. It’s expensive, but it’s very well-made and looks stellar. It’s a great fit with any contemporary decor. However, it doesn’t offer quite as much functionality as the Delta Kate. Control knob, spout, soap dispenser: these models usually feature an integrated sprayer on the spout, but that’s not true of all the offerings in this category. They’ll have one handle for flow and temperature control, a spout that swivels, and a dispenser for your dish soap (using a compartment that you refill as needed). Control knob, spout, sprayer: these models are generally the best use of space for most folks (aside from the above models with pull-down sprayers). After all, you can easily keep a bottle of dish soap by the sink, but you can’t easily add a sprayer separately. They have a single control knob for flow rate and temperature, plus a pull-out sprayer and a spout that swivels. Spout and handle with escutcheon: if you have a 3-hole sink but don’t like or don’t use dual-handle or sprayer fixtures, these models can be a good way to go. They cover up the two side holes using a wide plate called an escutcheon, giving you an integrated spout and control knob above the center hole. We generally like having a sprayer to clean around the sink, but if you’d rather keep things simple, this could be the best format for you. Central spout with two control knobs: this is the most traditional design for a kitchen sink to take, though as with the escutcheon format it’s not the most efficient use of space. You can find a quality 3-hole kitchen faucet for as little as $75. You can also pay as much as $350 for a top-notch model with maximum features and premium build quality. Think about how much you can afford to spend before you consider any specific models. If you’re looking for something with a sprayer, plan to spend at least $150. As with any plumbing fixture you buy, be sure to consider looks! After all, your kitchen sink is the centerpiece of the room. You want a faucet that matches the overall aesthetic you’re trying to achieve, as well as being functional. Think about what finish will look best in your space. Do you need to match the sink or other appliances? What about the design of the faucet? Do you want something sleek and modern, or something more ornate and traditional? Answer these questions for yourself up front, then picture our various recommendations in your space to get a sense of what will look best. In most cases, we suggest steering clear of chrome faucets. Why? The vast majority of the time, they’re cheap, painted plastic. There are certainly plasticky fixtures in other finishes and vice versa, but a chrome option that costs substantially less than others is usually a major red flag. You don’t want to be spending lots of money on a plasticky kitchen faucet that can’t hold up to regular use. Stick to stainless or nickel finish options to get a fixture made from brass instead of plastic. We hope you’ve enjoyed our look at the best 3-hole kitchen faucets. You can learn more about any of the fixtures we’ve recommended here by clicking on the links in our reviews. That’s the best way to see more images, explore finish options, and see all the pertinent details, such as warranties and flow rates. You can also find many more buying guides and reviews covering all your kitchen needs on our homepage, at kitchenfaucets.reviews!